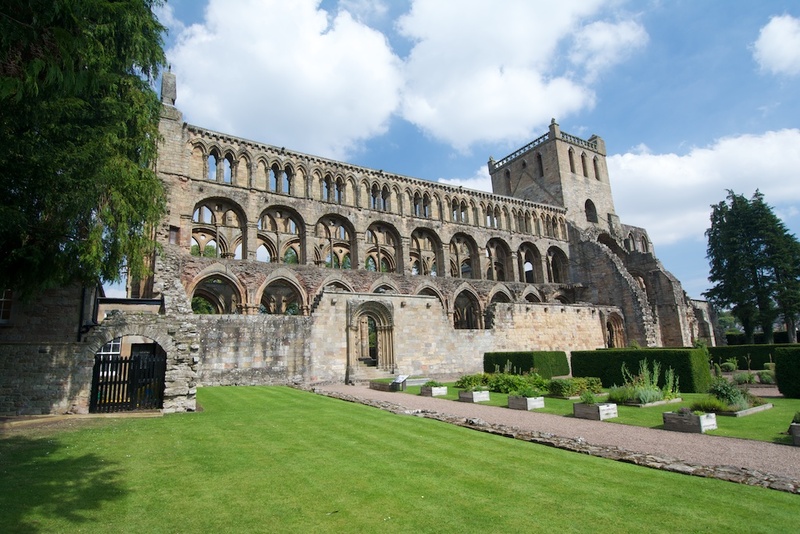 Since I’ve recently written about Dryburgh, I thought I would continue the journey with a look around a second Border abbey: Jedburgh. 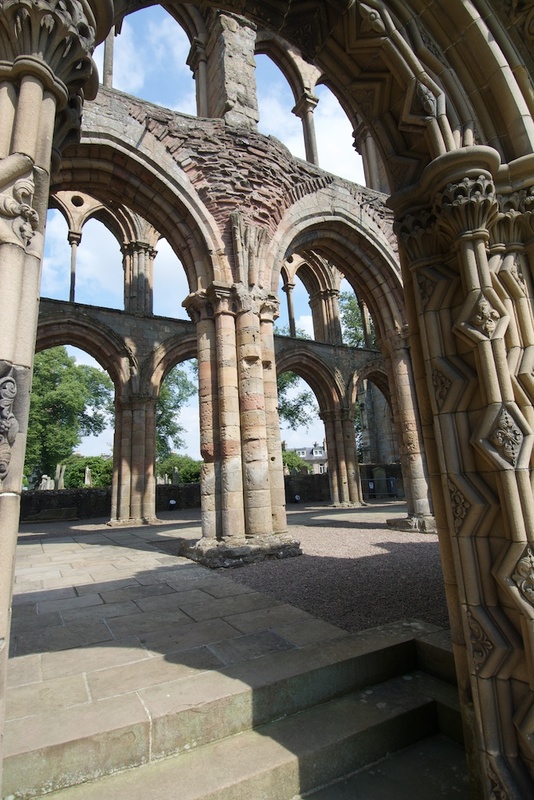 Dryburgh and Jedburgh have much in common, and so much that sets them apart. You can see the difference immediately. 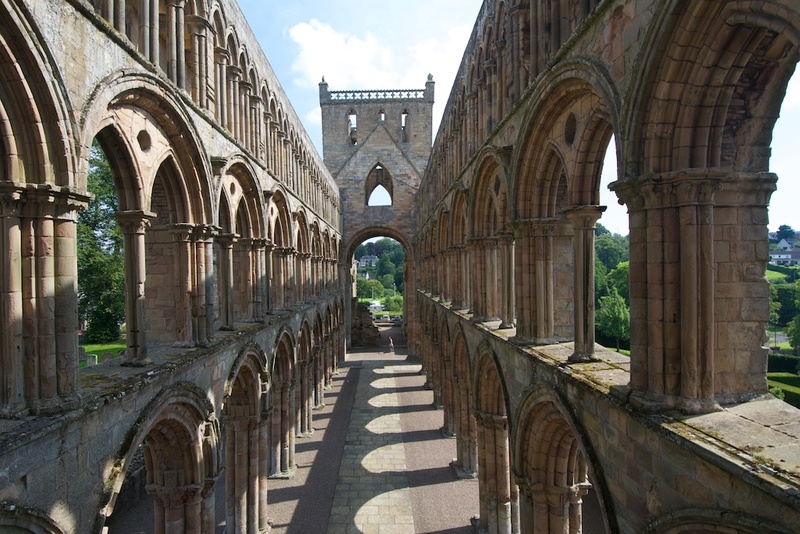 Whereas Dryburgh is all romance and poetry, softly crumbling away in a mist of solitude, Jedburgh is stark and bold and uncompromising, its roofless frame towering above the houses of Jedburgh like a gaunt old eagle mantling its prey. 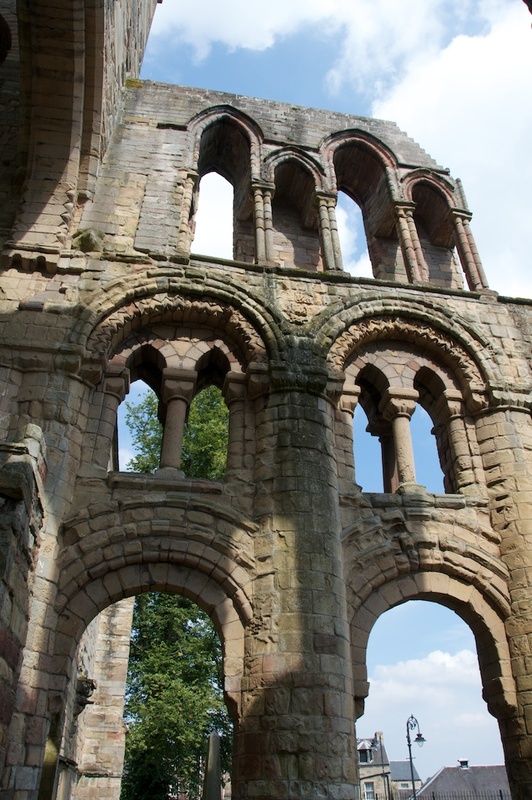 There’s one good reason for the contrast, and it’s quite simple: the church at Dryburgh has all but disappeared, leaving nothing but a few fragments, while the domestic buildings remain; but at Jedburgh the church has survived, and the monastic quarters lie in ruins. 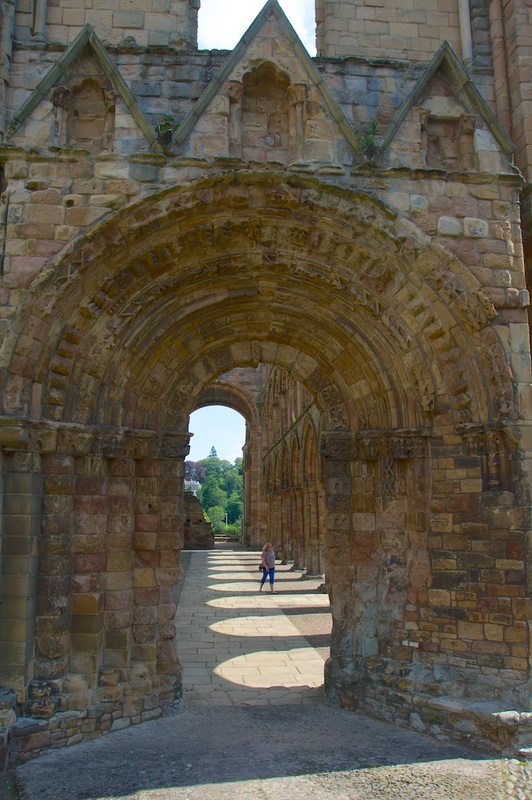 The result is that, at Jedburgh, your eyes are drawn ever upwards, towards those dizzy rows of arches upon arches; you step in and out of light and shadow and you feel a sense of awe, as if you’re walking between the ribs of a giant skeleton. It was at Jedburgh, on 14th October 1285, that Alexander III married his second wife, Yolande de Dreux. Alexander was an ill-fated king, even by Scottish standards: his first wife, Margaret, a daughter of Henry III of England, died in 1275 and within six years all of their three children were also dead. Alexander’s only heir was his infant granddaughter, also called Margaret, known as ‘the Maid of Norway’ through her mother’s marriage to that country’s king, Eric II. In later years, some writers sought to downplay the significance of the spectral guest, while offering no real explanation for it whatsoever. But just a few months after his marriage, as he galloped through a wild and stormy night in his eagerness to see his young bride at Kinghorn in Fife, Alexander’s nemesis caught up with him. His horse stumbled in the darkness and threw him from the saddle. His body was found the next morning, at the foot of a cliff. Yolande, reeling from shock and grief – and probably panic-stricken about her future – declared herself to be pregnant. This may have been wishful thinking, or she may have miscarried, but her claim came to nothing. The future of Scotland now rested on Alexander’s granddaughter, the Maid of Norway, and more importantly on the arrangement of her marriage. In 1290, still only six years old, Margaret was taken on a boat from Norway to Scotland, bound for a glorious and probably terrifying destiny. But she never lived to see it: she died of sea-sickness on the voyage, a little pawn in a greedy game of thrones. Scotland was now without a ruler, and her fate lay in the balance. I hadn’t heard of Alexander’s phantom follower when I walked around Jedburgh on a hot day in August, and if I had, I might not have been quite so keen on ascending yet another dark and tightly winding stair that leads you up to the second storey and gives a breathtaking view down the nave. It’s possible to walk up there from one side, enjoy the view from the balcony, and then descend via an equally vertiginous stair on the other side. Safely back at ground level, I stepped through the huge arch of the west door and turned to look back – an awe-inspiring sight. The trouble with building so many beautiful abbeys in the border country was that they offered such great targets for attack. David I wasn’t at all put off by this thought, and it is to him that we owe the grandeur of Jedburgh, Melrose and Kelso. Sadly, as well as being centres of purity and devotion, they also attracted the unwelcome attentions of English forces. 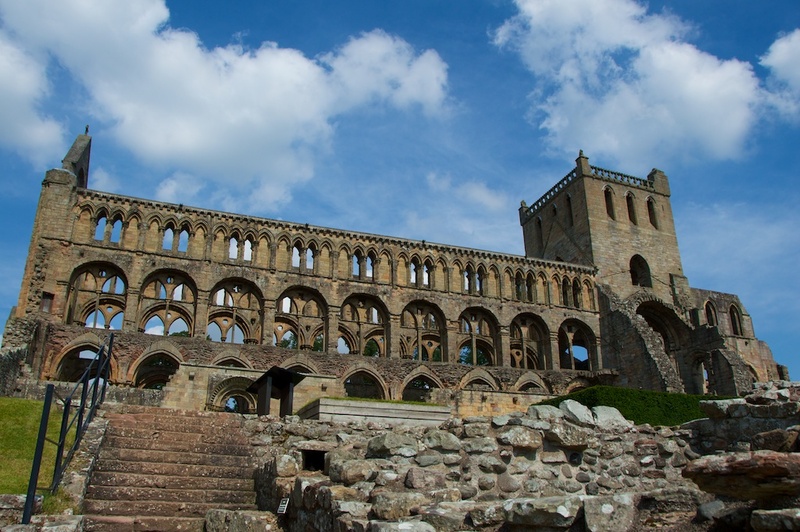 The death of Alexander III signalled the start of the Wars of Independence, and Edward I of England stayed at Jedburgh Abbey in 1296, on his way to cause trouble further north. 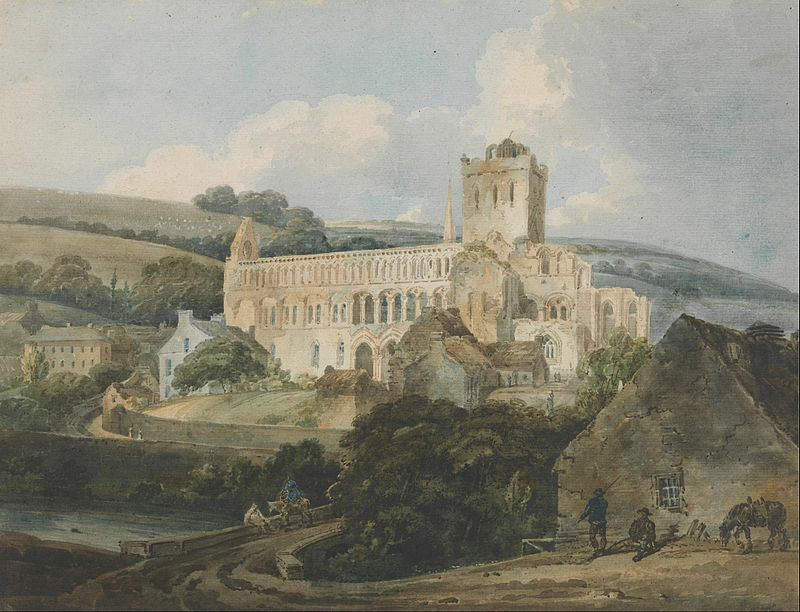 Faced with little option, and aware of the fact that his abbey owned extensive lands south of the border, the Abbot of Jedburgh had sworn allegiance to Edward at Berwick upon Tweed. From then onwards, Jedburgh seems to have been batted back and forth between England and Scotland like a shuttlecock. In 1305, lead from the church roof was stripped off by the English and melted down to make siege engines. 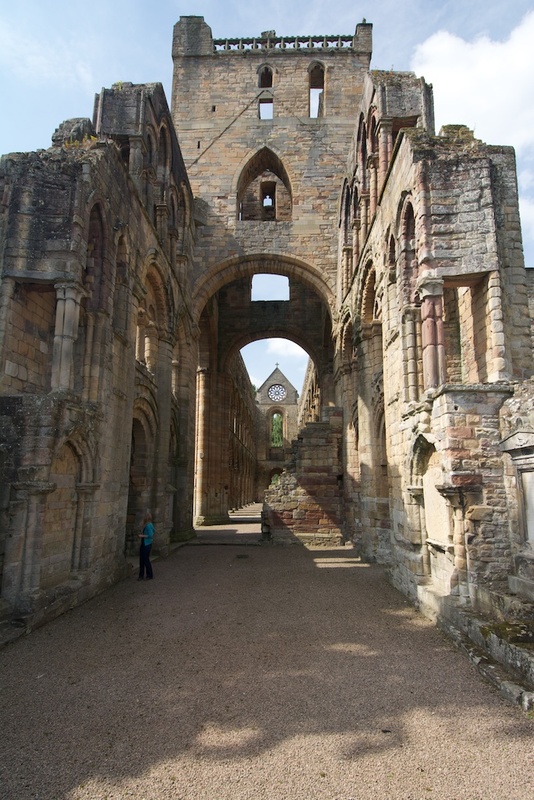 The abbey was attacked at least eight times in the 15th and 16th centuries before falling victim – like so many others of its time – to the axe of the Reformation. In the mid-1500s a French army, who had allied themselves with the Scots, altered the top of the tower so that they could fire cannon from it. Today, the Jed Water still wends its way beneath the walls of the abbey, and from the rubble foundations of the monastic quarters you can see how cleverly terraced the site was, dropping quite steeply down to the river. The restored cloister garden has been planted with the same kinds of herbs that would have been grown by the monks, for culinary and medicinal purposes. 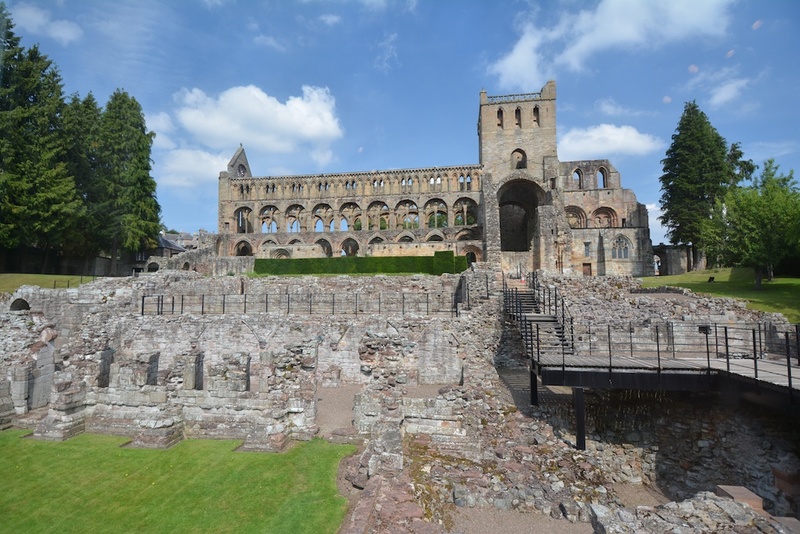 Jedburgh Abbey is in the care of Historic Scotland. There’s a lovely visitor centre with exhibits of early Christian carvings, and a model of the abbey as it would have looked in medieval times. There’s also a box of period costumes for children to enjoy dressing up – I’ve never seen this anywhere else! 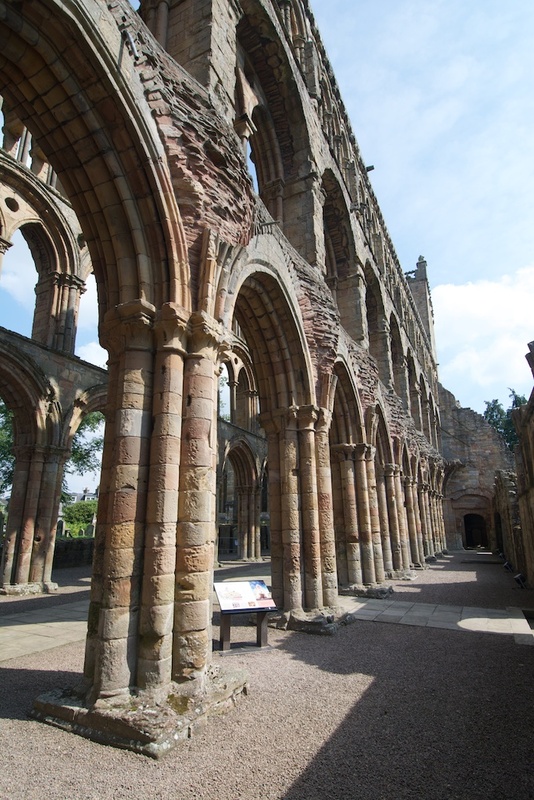 As for finding the abbey, all you need to do is find Jedburgh, which is on the A68 about nine miles south of both Kelso and Melrose. 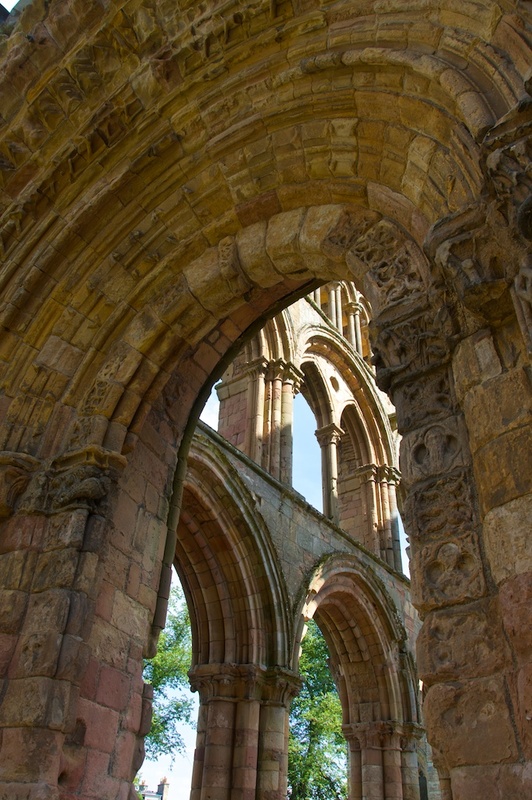 In fact, the three abbey towns form a ‘golden triangle’ of Scottish history, with Dryburgh Abbey at St Boswells enclosed within it and making an unmissable fourth. Ahhh,,,,You have allowed me to relive my visit here Jo. It was about this same time last year. You really get a sense of the medieval here. It’s astounding these ruins still exist from that time. They are magnificent. Don’t you wish you could have been there for the wedding feast of Yolande and Alexander? I think that would have been fantastic! Glad to hear that, Susan! Yes, what a place – astounding that they have survived, as you say. Oh yes, I do wish I’d been there at Alexander’s wedding! For so many reasons! Haha! You’re right, Pat. Strangely enough, I’m just putting together a feature on haunted castles, ready for Hallowe’en. 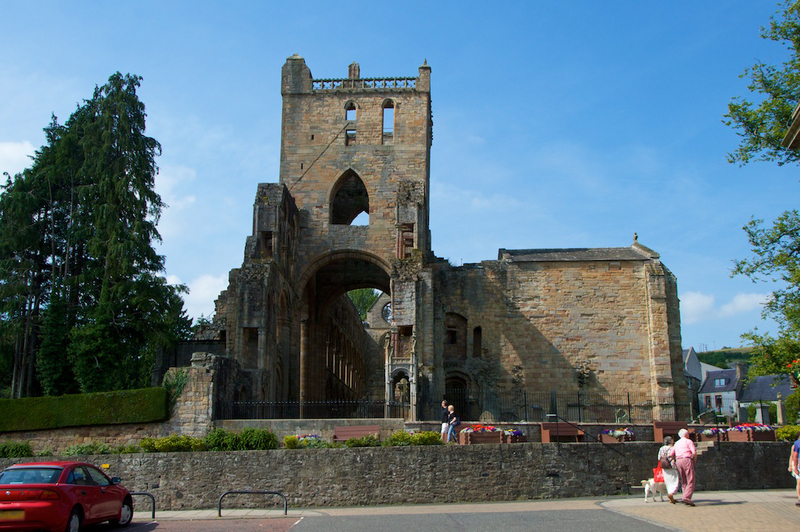 So glad you liked this, and thank you – Jedburgh was a wonderful place to visit and to photograph. 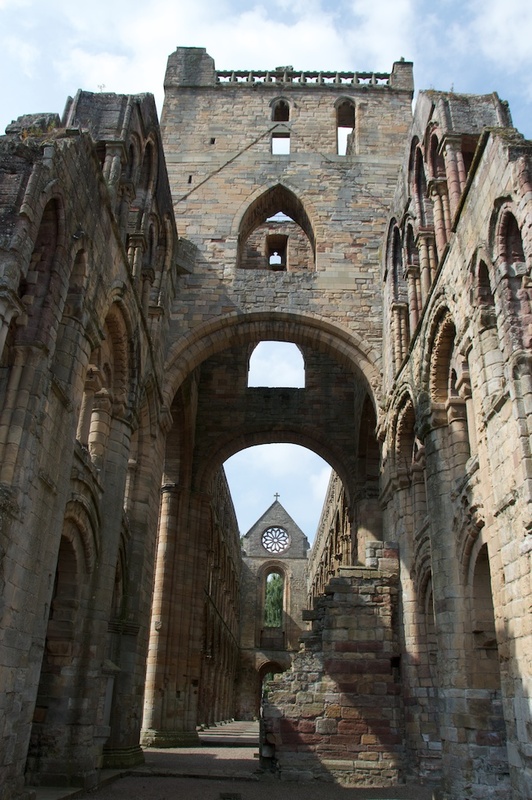 My aunt lives in Jedburgh so I’m rather ashamed to admit that I’ve never visited the Abbey. I had no idea that it was so extensive so thank you for a wonderful report and beautiful photographs – as always! Oh dear! 😀 I’m hoping you might go and see it now, David! It’s often the case though, that when you have family somewhere you do different things. Thank you, you are most kind! Another one for my long list of must-see places. Thank you for the great photos and story! Thank you very much, Andy! I have been wanting to see both Dryburgh and Jedburgh for ages now, and they are both wonderful. I think you would love them. Thanks, Lynne! Yes, Jedburgh has such a commanding position, and it really draws the eye. It’s harder to find Dryburgh! Wonderful pictures and history of an amazing structure. Is there a conflict of dates in your first and second paragraphs? It would seem that Alexander III married ten years after he died, or have I got the wrong end of the stick? Thanks very much, Viv! What a spectacular place it is. No, it was Alexander’s first wife, Margaret, who died in 1275 and he married again in 1285. Superb photos, Jo, and I like your ribs of a skeleton analogy, it’s exactly like that. What a beautiful day you had for your visit. 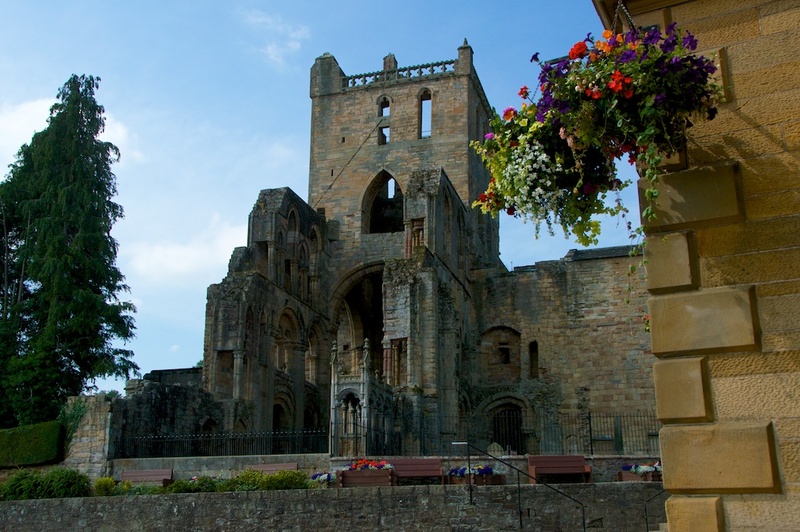 Thank you, Lorna – yes, Jedburgh was lovely and I’d like to explore the town further at some stage. Also, there’s a ‘Mary Queen of Scots House’ which I managed to miss. Thoroughly enjoyed that, Jo. Our first holiday as a family (when our son was just a few months old – he’s now 31) was spent in Jedburgh, so it has a special place in my heart. We spent some time in the abbey ruins during the week we were there, so it’s interesting to learn a bit about the history of the place. Thanks, Alen! Glad you enjoyed it. I wonder if the town looked any different back then? Not a lot, I would guess. Time seems to pass quite slowly in the Border country. It was a lovely place, Jo, and I haven’t been back since. The best memory I have is of a dish of parsnip and apple soup in a local cafe. I have tried to replicate the recipe ever since, but with no luck. I live and experiment in hope. Oh no! That’s frustrating! It sounds delicious. Great pictures, but if time permits you may want to return and take photos on an overcast day, just before dark as the fog is rolling in. That would be unbelievably spooky. It would be even better if you could get a raven in.